The Sandgropers, Bowls WA’s Representative Bowling Arm Side, are preparing for the 2018 National Bowling Arm Challenge (East Maitland NSW September 10 – 13) by accepting Expressions of Interest. There will be scheduled practices and players are encouraged to enter the Arm State Championships which will run within the All Abilities State Championships at Kardinya over the weekend of April 7 & 8. 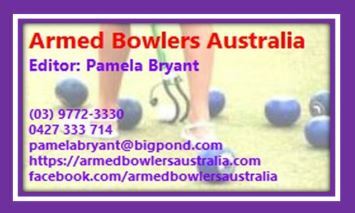 Laurie Blurton is the Arm Coordinator and can be reached on 0427 097 935 or blurts@bigpond.com. If clubs can post the Flyer and EOI (Expression of Interest) form at their clubs for interested members it would be appreciated.